Cheesie Mack and Georgie Sinkoff are back, and this time they're off to the greatest summer camp in Maine. As the oldest of the Little Guy campers, they'll get to make the campfires and choose the sports teams. It's sure to be their best summer yet! Lindermann had already left for flag-raising duty, and while I was in the bathroom doing whatever and brushing my teeth, I heard Kevin yell, "Cheese-Runt wet his bed!" Georgie shoved his way to the front. "It's water! You poured it." Kevin took a swig from a plastic water bottle. "Nuh-uh. Smell it. I dare you!" "Don't bother, Georgie," I said. On the way to breakfast, Dutcher snuck up behind me and Georgie and growled like some sort of monster. We jumped and Lenny shouted, "The Abominable Snowman!" Dutcher laughed. "Last night I told them about when I was in the Himalaya Mountains and the Yeti"�his voice got mysterious�"came out of the mist. He was big. Bigger than two men. He came closer. I was hanging onto the side of Mount Everest�"
"You never went to Mount Everest!" I said. "Maybe not," Dutcher said in his normal voice. "But last night's story did." "Our counselor stinks," Kevin said as we reached the flagpole. I looked back. There were at least twenty-five kids between us and Lindermann. He couldn't hear. "Our counselor, Ronald�"
"�Lindermann. He says�"�Kevin's voice got all whiny�"'I don't know any ghost stories.'" Dutcher gave Kevin a stern look. "Give the guy a chance, Kevin." I didn't like agreeing with anything Kevin said, but Ronald Lindermann was definitely not as good a counselor as Scott Dutcher. But then again, I thought, as I put my hand over my heart for the morning pledge, who was? At breakfast I was still on server patrol, so I walked to the food window. Normally I'd move faster, but I was musing about other names for the Abominable Snowman, like Yeti, Sasquatch, Big Foot. (If you know something about Big Foot, please put it on my website.) 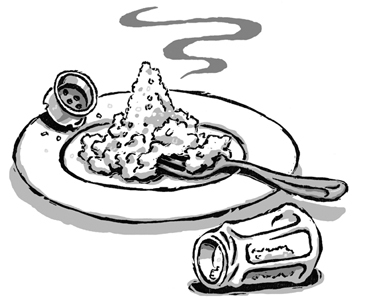 I almost bumped into a platter of scrambled eggs that Lana Shen was holding out toward me. "Take it," she said. "I'm paying you back for helping me last night." "Thanks," I mumbled, wondering how long she'd been standing there waiting for me. I walked back to the Cabin H table and set it down. I was really hungry. I watched the platter go around the table. When it got back to me, I scooped the last of the eggs onto my plate and noticed both Kevin and Ty were staring at me and grinning. "Why don't you take a picture? It'll last longer," I said. "Stare all you want," I said. "It just makes you look stupid." I stepped away from my computer for less than a minute to get a snack, and when I returned, someone had changed what Cabin H did to ballet. I suspected my dad, who had just gotten into the shower and was singing badly to hide his obvious guilt. So I stuck my head inside the bathroom and asked, but he just sang louder. 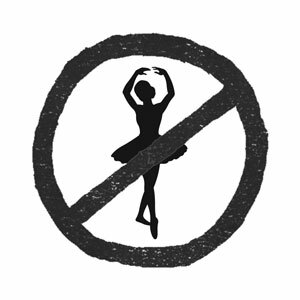 So I am leaving "ballet" in until he confesses. And just to make sure he confesses, I have stolen his fake foot, which he does not wear in the shower. So if you are reading this, he has not confessed and has either grabbed his foot back from me or is hopping around. I explained why he has a fake foot in my last book. It had to do with a bomb on an aircraft carrier when he was in the Navy. Sticking "ballet" into my book was sort of an insult. That meant one point for her because no one else knew about it. Since this all happened while I was writing after the summer was over, I can't include these points in the running totals in this book, because the book gets to "The End" before the summer ends. Excerpt copyright � 2012 by Stephen L. Cotler. Illustrations copyright � 2012 by Adam McCauley. Published by Random House Children’s Books, a division of Random House, Inc., New York. "There is a place in Massachusetts called Lake Chargoggagoggmanchauggagoggchaubunagungamaugg. It's true! Granpa took me fishing there. You can hear him pronounce the name on my website." Will middle-grade readers practice until they’ve memorized the longest place name in America? "At the close of Cheesie Mack Is Not a Genius or Anything (2011), soon-to-be�sixth-grader Ronald "Cheesie" Mack and his best friend Georgie secured the funds to go to summer camp on Bufflehead Lake in Maine. Days later, the duo climbs aboard a bus and head off to Camp Windward. Unfortunately Cheesie's older sister, June, a.k.a. Goon, will be none too far away at Camp Leeward. When they arrive, their misfortune is compounded when their late registration results in both boys being stuck in a cabin with the older guys� including Kevin, the Goon's boyfriend. Can Cheesie prevail and still have fun at the camp he worked so hard to attend? Cotler's second in the funny and (sneakily) educational Cheesie Mack series is summer-camp fiction and interactive fiction perfected. The promise of volume three on the way will have readers cheering. Wind-WHOOP!" 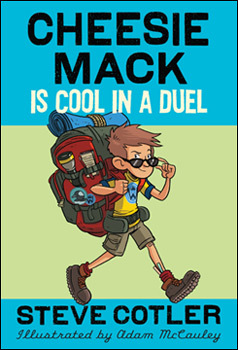 "It's off to sleepaway camp for 11-year-old Ronald "Cheesie" Mack and various family members, friends, and enemies in this sequel to Cheesie Mack Is Not a Genius or Anything. Similar in breaking the fourth wall and featuring lighthearted spot art, this outing relies even more on references to the character's website for opportunities to interact with Cheesie/Cotler and extend the book. 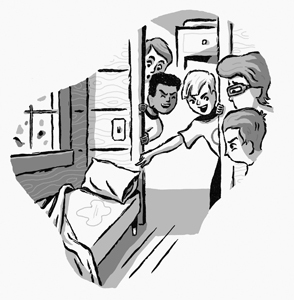 While involved in a competition to be named the coolest kid in his cabin of mostly older guys, Cheesie experiences lots of typical camp stuff (short sheets, scary stories, scarier girls) and has a great time, just like the reader will." "The story has charm and appeal and is filled with words (and their definitions) that will expand readers' vocabulary. Humorous illustrations appear throughout. With an uproariously funny and equally unexpected climax, the book should appeal to most anyone who picks it up. 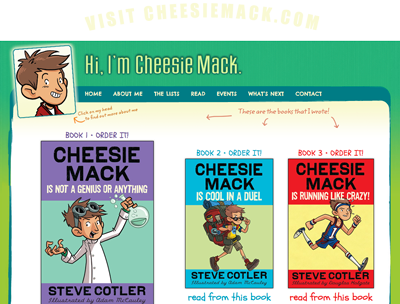 Cotler has created a website for Cheesie and welcomes submissions from readers."